2018 Iowa Meat Convention - Polashek's Locker Service Inc.
Iowa Meat Processors Association held the 82nd Anniversary Convention and Trade show in Ames February 15-18, 2018. Approximately 275 people representing 38 processing plants and 41 supplier members attended the event. Cured Meat Competitions were held with the top entries taking home plaques. The awards were presented on Saturday evening at the Awards Banquet attended by 220 people. There were 295 meat entries from 26 processing plants. There were twenty classes that a meat processor could enter. The products were judged by teams of thirty professionals from Iowa State University and several other universities as well as some industry experts. Products are scored on external and internal appearance, flavor and aroma and workmanship. 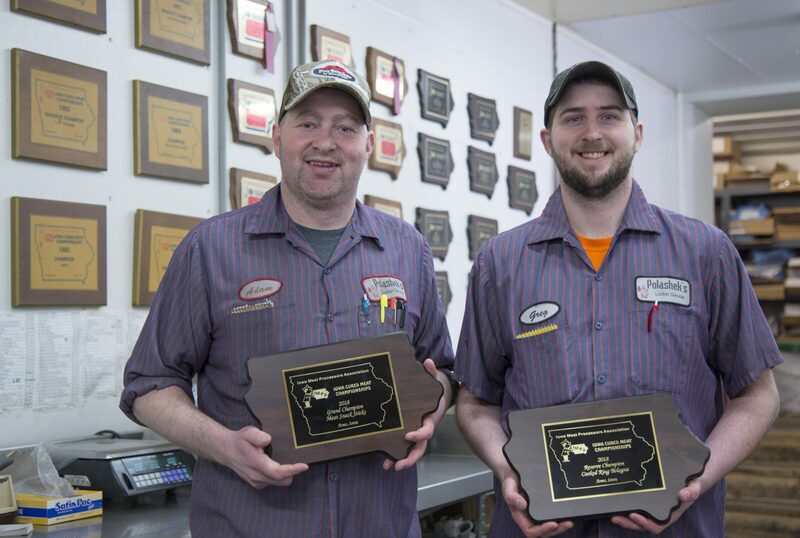 Paul and Adam Polashek, owner/operators of Polashek’s Locker Service in Protivin, received the following awards in the competition.